Got a pea-sized family engagement budget? Read this. In my experience in education, money always feels like an issue. There is never enough to complete projects or fuel initiatives, and we’re always trying to squeeze extra ooomph out of every dollar. My staff challenged me this month to show exactly what I would suggest for teachers and family coordinators at every budget level - including the infamous $0 budget. We cover how to spend money on supplies, professional development, and staff salaries and I tell you exactly when to bring in each aspect to develop your family engagement program. Whether you are a family engagement coordinator wishing for some guidance on to how to spend your dollars, or a new parent education coordinator creating a proposal for a supervisor’s review, you’ll get insight on what gets the most “bang for your buck” in schools and with families. This is exciting because we get into tactics and strategy. This email covers Part 1: Budgets from $0-250. Next month we’ll cover $500-$40k+! Before we dive in, though, I want to remind you there is something more valuable than $$$ to “make things happen” in schools. I’m not advocating for or giving a pass to low school budgets, but let me be clear: I’ve worked with schools that had large budgets set aside for family engagement and low levels of success. Meanwhile, some programs start from nothing but just one dedicated teacher committed to making it happen end up growing and growing. Money can certainly positively impact your program and give you freedom to do more, but it doesn’t guarantee results.This principle is true for many different industries, not just education. Without the passion to forming relationships with families and making it happen your initiatives are more likely to fail. Passion and commitment to engaging ALL families has to come first. We have plenty of resources to stoke passion here, but for the rest of this email, let’s assume passion is amplified for your project already. It might be coffee, a workshop, movie night, or a carnival. The answer depends on the community. A rural community at a school in the South will absolutely have different preferences, traditions, and definitions of a fun event than an urban, city school on the East Coast. Think about what makes your community unique - and what you might find them doing on a typical Friday night. Channel this into an event, and build upon the positive communication you’ve been cultivating with families. $0: The most important family engagement work is free. After deciding on your approach, the next few steps will cost you zero dollars. That doesn’t mean they aren’t important. They are very important! Even if you do have a budget, make sure you don’t skip these steps. Your school likely already uses some form of mass communication like “robo calls” or a digital messaging system. Upgrade your communication with social media. I’ve seen teachers create private facebook pages for the parents in their class, and parent outreach directors can create private groups for the whole school. Annie, one of our assistant’s here at FFS and local teacher, can vouch for facebook groups she’s participated in (see images below). 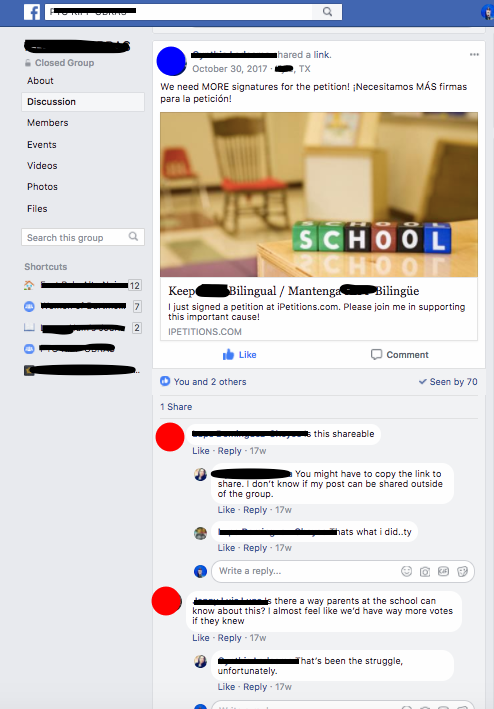 Parents, teachers, and admins post freely, answer questions, share information and get connected. Send posters or flyers home with students to announce to join the facebook group. Here’s a quick guide to facebook for educators. And here’s another link about one teacher’s pilot program using facebook groups for a kinder class. We talk about using family engagement teams later in this email at our $500 level, but you can start here for free. Request to make an announcement at your next staff meeting asking for help with your family engagement projects. Examples: Teacher volunteers can provide childcare when you can’t hire anyone, and potlucks are fun when there is no budget for food. Other resources: Check to see if your state has a PIRC - a Parent Information Resource Center. PIRC’s were federally funded a few years back. Some states have picked up the tab, but in other states they may have been dissolved. Family Friendly Schools provides an amazing, and free professional development resource: The Practitioner’s Backbone. We’ve designed TPB to get you free coaching and access to other family engagement professionals for quick fire Q&As. Even at the $0 budget level, strategy and support are critical to help you stay motivated, get feedback, brainstorm new ideas, and think strategically about growing your program and impact. This is invaluable, especially when it’s just you and your passion holding it together! If you have a budget, add food to all the free things you’re already working on to increase engagement. People love food. Pizza or popcorn are cheap and easy to share. Coffee and cookies or donuts are great for morning events. Publications like: “The Parent Connection”, “The Parent Playbooks”, or “Beyond the Bake Sale” help inspire ideas, motivate, explain concepts, and provide a direction. Build your library, and read them! You can even read the books and bring your questions to The Practitioner’s Backbone, like your personal study group. As you can see, there are plenty of ways to build a program with no or small budgets. It takes creativity, passion, and support to bring your vision into reality. As you go along, don’t let yourself get overwhelmed or get caught by comparison-itis. The point isn’t to focus on what you can’t do, but to get clear on all the options you do have to make a difference in something you care about and something that will help students succeed. If this email sparked ideas (and especially if it highlighted challenges) give us a call to brainstorm with you or leave a comment on our blog so another educator can see it and learn. We’re in this together! P.S. In next month’s email, we’ll cover the bigger budget tiers: $500-$40k+. Be on the lookout for it!